Loujon Press was an avant-garde publishing operation in 1960's New Orleans that was a pioneer of high-quality, independent publishing. Loujon Press was an avant-garde publisher operating during the 1960s in New Orleans. A pioneer of high-quality, independent publishing, Loujon Press was instrumental in launching and supporting the careers of literary icons Lawrence Ferlinghetti, Langston Hughes, Diane di Prima, Jack Kerouac, Allen Ginsberg, Robert Creeley, LeRoi Jones (now known as Amiri Baraka), and William S. Burroughs, among many others. Combining art, prose, and poetry and using a labor-intensive, old-fashioned letter press, Jon and Louise “Gypsy Lou” Webb published the now-famous literary journal The Outsider as well as books by Charles Bukowski and Henry Miller. Here, Jon Webb decided to employ his writing and editing skills in a grand new adventure: Loujon Press. Webb wanted to take independent publishing in a whole new direction from the conservative publications of the day, and he was none too subtle in his disdain for play-it-safe editors whom he thought were ignoring the freshest and most interesting new writing. “Little mag editors afraid to ‘let go’ in any creative direction they wish to, afraid to denounce anything they believe needs denouncing, who go on publishing the same old cliché rot of the academy they sprang from (playing safe and decent) ought to be lined up and shot—into immediate obscurity,” Webb wrote. By then Loujon Press had earned such notoriety among the champions of underground literature that Henry Miller agreed to work with them on publication of two of his books, Order & Chaos and Insomnia or the Devil at Large, in 1966 and 1970, respectively. In all, the press published three issues of The Outsider, one double issue of The Outsider, and four volumes of prose and poetry. It seems like a small catalogue, but the remarkable artistry, craftsmanship, and pioneering spirit have earned the press a much larger place in history. In 1971, when Jon Webb died in Nashville, Tennessee, Loujon Press died with him. Gypsy Lou continued to live in the French Quarter, where she frequently sold paintings on Jackson Square. She befriended fellow artist Noel Rockmore and appears in his painting Homage to the French Quarter, depicting French Quarter bohemians of the mid-twentieth century. In 1984 she moved to Slidell to live with her sister. Parker Jr., David "Loujon Press." In https://64parishes.org Encyclopedia of Louisiana, edited by David Johnson. Louisiana Endowment for the Humanities, 2010–. 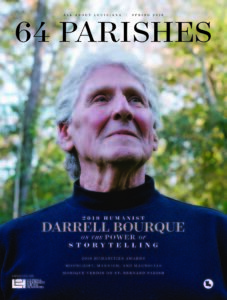 Article published November 30, 2014. https://64parishes.org/entry/loujon-press. Weddle, Jeff. Bohemian New Orleans: The Story of the Outsider and Loujon Press. Jackson: University Press of Mississippi, 2007.